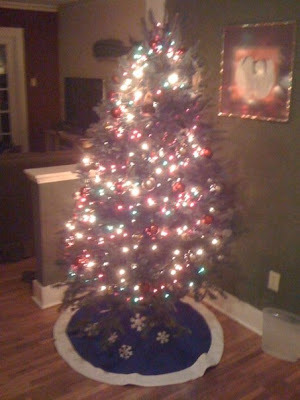 Last night Duvall, Jacob, and I put up the Christmas tree and decorated it with lights and ornaments. Christmas is still a hard time for me; I feel alone sometimes and miss the magic I once felt as a child. It has been years since I had a tree. Last year Jay and Karen had a tree, but that was not home. And the years before that Mom and I were too bummed to have a full-fledged tree... And before that, I lived with my brother and it was not home. Even before that, I was in NYC and would visit Bryant but it was not MY tree, MY home. So, for the first time in years there is a tree that is mine at the home of the Red Door. I do not know if Christmas of 2009 will be magical, but somewhere, faintly, in a new and also familiar place, I feel that Christmas magic is closer to me than it has been in several years. As I write this, I am sitting on the couch, resting, the lights are off and the tree lights dance about my dwelling. It feels like home, it feels right, and for the first time in a long time I am starting to believe that the childlike magic is still alive and might just visit me on Christmas.